Click any yellowed area on the map to open up a more detailed page or pages. The area that makes up what the French refer to as "le Midi", is generally speaking the most popular tourist region in France, and needs little introduction. 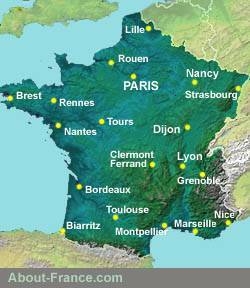 It consists of the French Mediterranean coastline and its hinterland, from the Italian to the Spanish borders, and is made up of two French regions, PACA or Provence-Alpes-Côte d'Azur to the east of the Rhone, and Languedoc Roussillon to the west of the Rhone.
. The coastal region is very busy in Summer, and travelling to the south of France by car on a summer Saturday can be a nightmare experience; but the region has masses to offer, in terms of climate, history, and landscape. The French Riviera ("la Côte d'Azur") is a small part of the south of France, the thin coastal strip from around Cassis (east of Marseille) in the west to the Italian border in the east. It is a coastline that gets very crowded in summer, though on account of the rocky coastline, there are still some quiet and peaceful spots to be found. However much of the actual coast of the French Riviera is fairly heavily built up in many parts, and accommodation is expensive, particularly in the most famous resorts like St. Tropez, Cannes or Nice. The mountainous hinterland, on the other hand, the "Alpes de Haute Provence" the "Hautes Alpes" the "Alpes Maritimes", is very attractive, with its small villages and towns, many of them perched precariously on hillsides or beside trickling rivers that become raging torrents in the springtime. The southern Alps are different from the northern Alps – drier, more rocky, and less crowded. Briançon, capital of the High Alps department, is the highest small city in Europe. And the Gorges du Verdon are the deepest in Europe. Those who do not want to spend their holidays being mass-grilled on a beach will prefer areas inland from the coastal strip, notably to the hills and mountains of Provence,with their dry landscapes and deep river gorges and valleys, or the valleys of the Cevennes, more wooded and rural, or the inland areas of the Languedoc. The historic area of Provence (which used to include land to the west of the Rhone as well as the east) has a lot of historic cities, such as Avignon with its famous bridge, Arles with its Roman remains, the Camargue, and the university town of Aix en Provence. The Languedoc region is the area to the west of the Rhone; it is known on the one hand for its long sandy beaches, and onthe other for its huge vineyards and "garrigue", arid rocky Mediteranean hills with their vegetation of scrub, aromatic bushes and occasional fields. 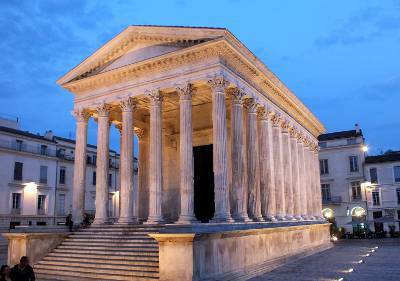 The most historic city is Nimes with its superb Roman remains. 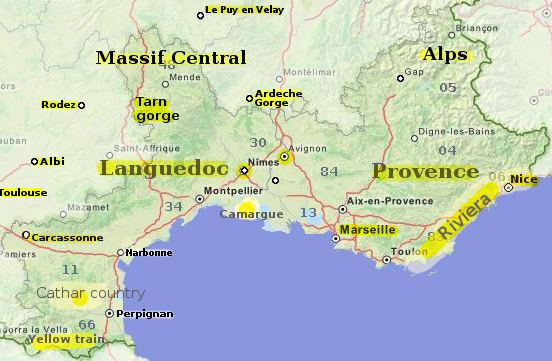 High Languedoc includes the southern flank of the Massif Central mountains, a dry mountainous area a bit different to upper Provence, and cut through by deep valleys such as that of the Tarn. The Languedoc coast offers large expanses of sandy beaches, between popular modern resorts such as Cap d'Agde or Le Grau du Roi. For those looking for lots of life and restaurants and bars, the Languedoc coast has plenty to offer; but with its some 200 km of sandy coasts, Languedoc also has some fairly uncrowded beaches, even in high summer. The southern end on the Languedoc includes the eastern end of the Pyrenees, a natural land barrier between France and Spain. The foothills of the Pyrenees are a beautiful mild part of France, famous for fruit and flowers. It is an arid part of France that was frequently fought over in the Middle Ages, and the famous "Cathar castles" and the fortifications of the city of Carcassonne stand witness today to this troubled past. the eastern Pyrenees can be discovered by taking an exciting journey on the historic Yellow train up into the mountains. For further west, towards the Atlantic, see Gascony . A short guide to "le Midi" - the South of France from the French Riviera to the Pyrenees. Its coast, its beaches, its mountains, its heritage and other points of interest. Text and photos copyright About-France.com except where otherwise indicated.